Starting in the valley of Munster, after having provided moisture to Turckheim, then Ingersheim, the Fecht River flows in the plain of Alsace where it is joined by the Weiss. In this fertile and fruitful place along the riverbanks, a first small congregation was established during the time of the Francs: Ostheim. By the year 785, Ostheim is already cited in the annals of our province. Here too, various religious establishments gradually took hold: the Abbey of Fulda which already had taxation and revenues, since the 13th century that of Ebbersmunster; since 1463 the monastary of Etival, as well as the Command of the Teutonic Order of Kaysersberg. Until the Reform Era, the parish belonged to the charge "Ultra Colles" of the Evêché of Bâle. In 1187, it was administered by a "Leutpriester" and in 1441, a rector and a vicar were in residence. Agriculture, raising livestock, then fishing, thanks to the proximity of water, had been the basic occupation of these modest settlers since ancient times. 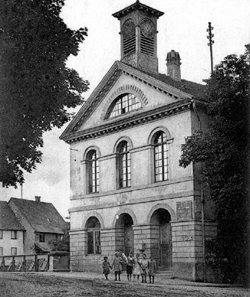 Having belonged to the domain of the counts of Horbourg in the 13th century, the village of Ostheim became part of the house of Wurtembourg in 1324 where it remained until the French Revolution. This was the domain of Riquewihr which included the regional villages of Beblenheim, Mittelwihr, Hunawihr and Aubure with Riquewihr becoming the capitol of this small territory. In the years that followed, Ostheim was subjected to the struggles for which our country was the theater: the war of the Armagnacs, the war of the Peasants, the 30 Years War, and other events of the wars of the 17th century. During these wars, many inhabitants took refuge in safe places, in Riquewihr or in Ribeauvillé, which led to the complete depopulation of the village from 1635 to 1642 during the 30 Years War. Following the example of what was done in the Wurtembergian region of Alsace, the Reform Era was introduced in Ostheim in 1535. Towards the end of the 17th century, in 1686, the village became the residence of the princess Anne of Wurtenburb, called the Duchess of the dogs, daughter of Count Georges. At that time, Ostheim and Aubure were separated from the domain of Riquewihr in order to be an exclusive posession of this princess who reigned in her Manor of Ostheim, surrounded by a veritable court of dogs for whom she even constructed a commemorative chapel. She died in 1733. What remained of the chapel was totally destroyed in 1944. Throughout the 18th century, Ostheim continued its evolution due the labors of its inhabitants who took advantage of the fertility of the surrounding area. Situated on both sides of the Fecht River ("the rapid one, the impetuous") which were joined by a sturdy bridge, the rural town had 120 residences. According to a new assessment of the number of properties there were 14 large 1st class buildings belonging to the Kessels, Oehlerts, Ostermanns, Umbdenstocks, and others: the Ostermanns were well known throughout the land as "Masters of the HorseDriven Postal System". Favorable circumstances contributed to the steady expansion of the village and by the middle of the last century it contained 1731 inhabitants, a cotton gin, a mill, and a sawmill. Ostheim had now become a "real town" and the single church had become too small, which was noted "with chagrin" by the town council. It was not until 1854 that each denomination had its own church. The installation of the railroad line crossing the Plain of Alsace and of a station situated just a few hundred meters from the town brought about a real expansion to the commune, which, as we know, had always been situated on the route linking Strasbourg and Lyon. It's 1944, already four years of turmoil. Now the war is at the heart of the village and the cover of its shadow is like a veil of death. On the 5th of December the American troops take possession of the left side of the Fecht. The Germans blow up the bridge over the river and hold on to the right side of the river. The front of the famous "Encampment of Colmar" crosses Ostheim. The suffering begins. It will last for sixty days. Neighborhood by neighborhood the houses are shelled by the artillery and burned. Hiding in the basements often half buried alive or asphyxiated, the inhabitants could face death at any moment. At last the 20th of December, the Germans order the evacuation to Colmar of the civil population in their sector. On the 25th of December the Americans do the same. Now that at last the "Encampment of Colmar" is reduced and Alsace definitively liberated, what remains of Ostheim? 98 % of Ostheim was destroyed: 553 buildings, including 165 houses which were 100% destroyed, 27 apartments which were 75% ruined, 103 which were half damaged, and 70 which were 25% damaged; the town hall, the two churches, a school, a mill, two sawmills, an industrial chees dairy, and the Schoppenwihr estate were not part of this sad scene. Sixteen commercial and craft enterprises are in ruins, six businesses are half destroyed. Our farmers lost 150 horses, 400 sheep, 270 pigs, 3500 to 4000 chickens, 90% of the farm facilities and equipment, 2000 fruit trees, uprooted or on the verge of death, the 1944 harvest destroyed, that of 1945 insignificant, following the mining of 80% of the surrounding land. Finally, heavy losses among the population added to the unhappiness of the disaster victims making their fate even more tragic: the fight for the Liberation cost us 12 dead and 15 wounded civilians. Only the Nest of the Storks, built many years ago on the gable of the Ostermann house, former way station for the "Pony Express", stood up to the turmoil. But, the following March, when the storks came back to their old nest to roost, the wall was no longer a ruin. It became a "symbol of life". Now, our commune has been completely reconstructed. With its Stork's Nest above the Monument to the Dead from the Wars of 1914/18 and 1939/45, its two churches, Catholic and Protestant, having been rebuilt in a modern style on the flowered banks of the Fecht , and with its clean, charming, and attractive quality, Ostheim is now a tourist attraction throughout the region and even beyond. In particular, since the construction of the new route for the expressway it has become a peaceful village where one can spend a good vacation.